Welcome! Buy Schaeffer Oil At Great Prices! 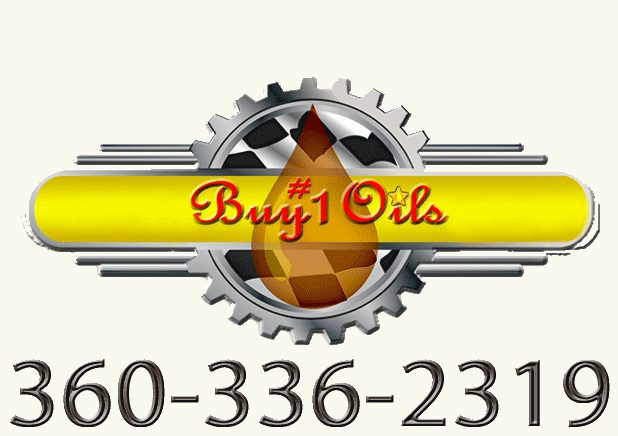 "Buy1oils: The ORIGINAL 5 STAR online retailer offering the full line of all Schaeffer's Specialized Lubricants & Oils"
Buy Schaeffer oil products at great prices online or call 360-336-2319 to place your order. Find industrial oils, Citrol cleaner, Harley Davidson oil, hydraulic fluids, diesel fuel additives & more! Have you ever wondered who sells Schaeffer Oil? We sell lots of it here week in and week out. Why? We answer our phone and emails and people trust they'll get the right answer which builds trust, respect and a desire to keep us in business which we are very thankful for. So keep up the calls and we'll keep providing that personal service that you can count on and trust! You will find all TD Sheets & MSDS Sheets as links found on every product sold here. This is a great resource for acquiring knowledge of Schaeffer's Lubricants and we have all of their products for sale. Our site search engine is easy to locate products by name or number. Compare Data and make an informed choice. 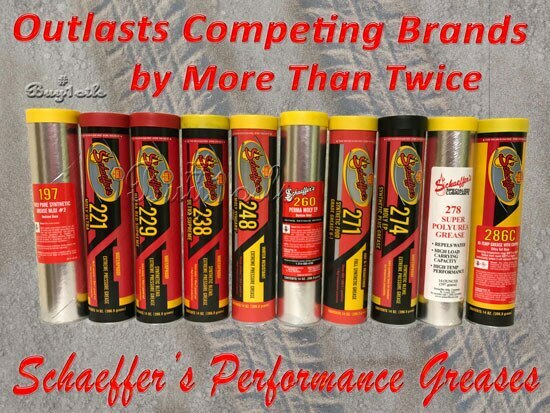 Schaeffer's Waterproof Greases Last Longer Than Competing Brands! Known for lasting two to three times longer than their competition, Schaeffer grease is also waterproof. Schaeffer synthetic grease will not mix with water. Schaeffer grease comes in various applications that are versatile, multipurpose, tacky, extreme pressure, food grade grease and heavy-duty & hot applications. Schaeffer's Engine Lubricants is Now Easy To Find Online and Purchase Here For All Your All Your Lubrication Needs. Always known for the difficulty it is to procur, Schaeffer engine Lubricants are now easily found and purchased online here at https://stores.buy1oils.com. Need Schaeffer products in Bulk? Or if you need Schaeffer's in small quantities, we are here to serve you! Schaeffer's Cutting Edge Lubrication Additives and Conditioners Take Synthetics Technology Futher. Synthetic lubricant technology has come a long way since Amsoil was the first to engineer an acceptable synthetic lubricant for engines to meet American Petroleum Institute's service requirements in 1972. Today there are eight grades of synthetic base oils to formulate a company's synthetic lubricants formulation. 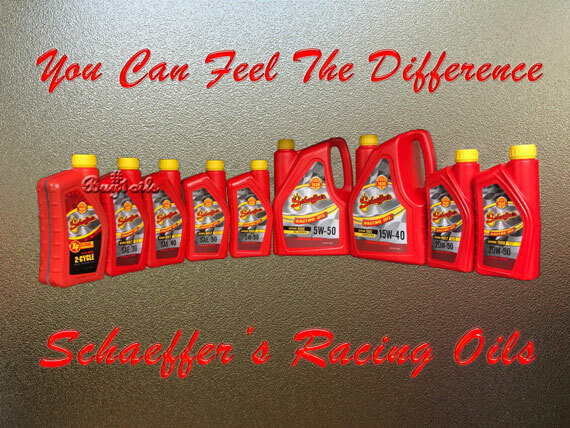 Schaeffer's products starts by using only the number one,(#1) most refined, synthetic oil base stock. Schaeffer has not stopped here; they have patented Penetro and Micron Moly as friction modifiers that further reduce heat and friction. Schaeffer blows away all their competition and claims 3-5% better fuel economy when comparing other synthetic oil. Schaeffer also has pioneered other hydraulic additives like VarniShield. VarniShield eliminates the buildup of varnish and sludge in all types of high pressure hydraulic systems. VarniShield helps prolong filter life, optimum fuel efficiency and extend hydraulic oil drain intervals. New VarniShield hydraulic fluid technology is formulated into their HTC and Di-LEX line of superior quality hydraulic fluids. Varnish is a bi-product of oil oxidation. Varnish is especially troublesome to servo valves, pilot control valves and other tight tolerance system components. Varnish causes sluggish operation and increases system temperatures to rise which leads to more oxidation. Energy costs rise dramatically and Hydraulic filters need to be changed more and more often. Schaeffer's has more innovative additives & products that help reduce oil consumption and prolong engine life, such as; hydraulic systems, motors, bearings, bushings, injection systems, turbo chargers, transmissions, final drives, chain drives, oven lubricants, food equipment, ball joints, conveyors, mining equipment, blast furnaces, hinges, pins, open and closed shafts, open gears, cable systems and racing oil. 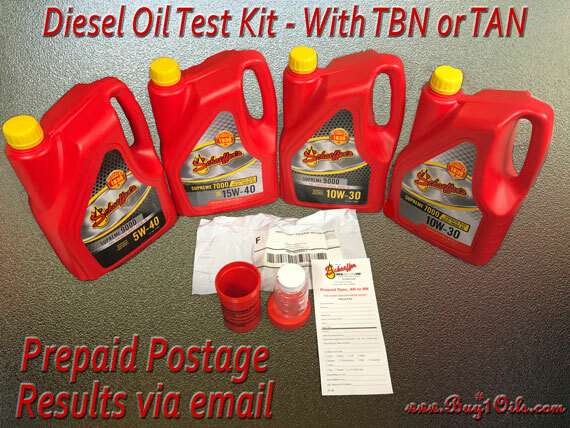 Extended Drain Intervals - Webscope PM Oil Testing - Buy Here! Wisdom and responsibility when it comes to your engine is our concern. Webscope PM testing program is the answer to get your drain intervals out as far as possible without harming your engines. When switching to Schaeffer Supreme 9000 full synthetic or Supreme 7000 synthetic plus, Schaeffer recommends a 9000 and 7000 mile drain interval followed by their Webscope PM testing program. This test insures their customer usage and engine condition is suited to the proper drain interval. When testing your first drain interval ask on the Webscope test sheet if the drain interval can be extended beyond the 9000 mile or 7000 mile interval. 919 Webscope PM test labs take a conservative approach in extending your next drain interval. Not all engines and uses are equal. Join many Schaeffer's oil customers who are experiencing extended drain intervals by use of Webscope PM oil analysis. When filling out your test kit be sure and ask for an interval recommendation.